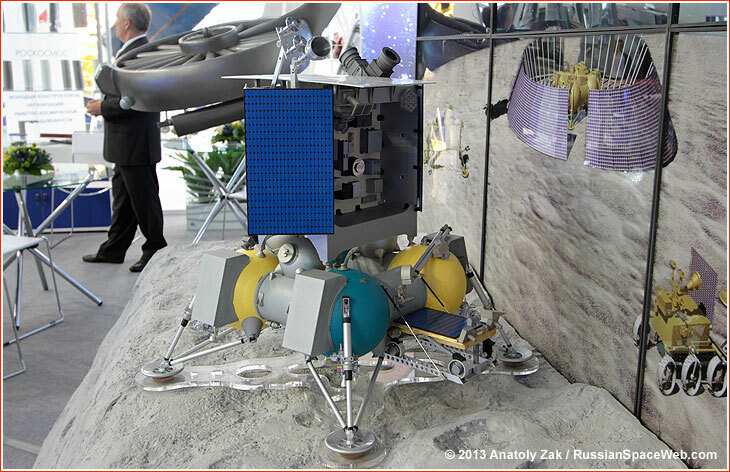 Above: During Moscow air show in August, a small rover to be provided by India for the Russian Luna-Resurs mission (above) was facing the wall of the exhibit, hinting a withdrawal of the Indian space agency, ISRO, from the project. Russian space officials confirmed all but inevitable postponement of the nation's unmanned missions to explore the Moon. A new schedule unveiled this week at the 4th Solar System Symposium in Moscow calls for the launch of the Luna-Glob lander to a polar region of the Moon in 2016, followed by the Luna-Glob orbiter, designed to circle the Moon, in 2018. The mission of the Luna-Resurs lander (aimed to land near the Moon's South Pole) was pushed back to 2019. During the conference, Russian officials also confirmed a long expected withdrawal of the Indian space agency, ISRO, from the Luna-Resurs mission. A very small and largely symbolic Indian rover had been originally timed to hitch a ride to the Moon with the Luna-Resurs as early as 2013 or 2014 in an effort to match a similar Chinese mission, however, the plan collapsed after the failure of the Russian Phobos-Grunt mission in 2011 had led to years of delays in all subsequent Russian missions to the Moon and Mars. Luna-Glob and Luna-Resurs landers will conduct in-situ experiments on the Moon, with the latter spacecraft drilling into the surface in search for lunar ice. The Luna-Resurs orbiter would conduct remote-sensing experiments from orbit. 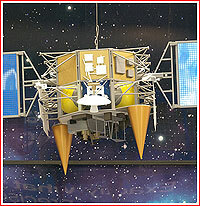 Following the Lunar-Resurs mission, the Luna-Grunt spacecraft (a.k.a. Luna-28) was now projected to fly at the beginning of the 2020s with a goal of returning soil samples from the polar regions of the Moon back to Earth. The new launch dates for all three missions slipped from six months to two years from those in the previous official schedule, which had been reported to be practically unachievable as early as April. The failure to meet the nearest Mars launch deadline in 2016 would mean an automatic two-year domino effect of delays for the 2018 Mars mission, likely catapulting most of the Russian lunar exploration missions toward 2020s. Only after accomplishing two landings on Mars and the return of soil from the Moon, could Russian space scientists make another attempt to return soil samples from the Martian moon Phobos, fulfilling the original goal of the disastrous Phobos-Grunt mission. The new mission to Phobos, currently dubbed Bumerang (Boomerang), is not expected to fly until 2022, at the earliest. In turn, a much more complex and long-sought attempt to return soil from Mars itself could proceed next. According to a very preliminary (and optimistic) schedule, the dual mission to bring rocks from the Red Planet could be launched by a pair of Proton rockets around 2024, but, given all the hurdles ahead, it could easily slip until the end of 2020s.